Can I monitor, or control, the bandwidth used on my home network? It's possible, even easy, to monitor the amount of bandwidth a computer is using. It's much more difficult to control. I have 3 kids, each has his own computer, I have a laptop, and we are all sharing an ADSL connection. Sometimes one of the kids hogs the network and everybody else does not get any bandwidth. And I sometimes want to lockout one of the kids from the internet so he will turn to other activities ... such as his homework. Bandwidth is a lot like having kids: monitoring is easier than controlling. Let's start out with the good news. The ability to monitor your network and a lot of other items is built in to Windows XP, Windows 2000, and Windows NT in something called "Performance Monitor". 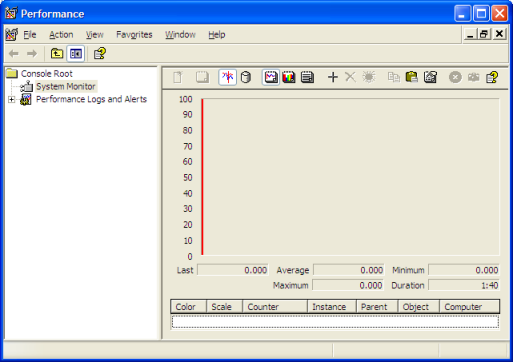 Perfmon is an incredibly powerful monitoring tool. There are lots of things available to monitor, and many display options. I encourage you to play around with it some. Of special note is the Select Counters from Computer option in the Add Counters dialog above. Perfmon allows you to monitor the performance of another Windows XP, 2000 or NT computer remotely, across your LAN. This means, for example, if someone on your network is hogging all the bandwidth then you can monitor each machine remotely in real time to see just who that might be. Monitoring is fairly easy. In addition to Perfmon there are certainly many third party applications that will allow you to do the same with different display and even triggered actions. Control, on the other hand, is the bad news. True control of something shared like a DSL connection can be done, but it gets costly. It's typically performed by high end routers that allow you to specify, often in great detail, how the bandwidth should be allocated or prioritized. Unfortunately that's usually out of reach of the most home LANs. In all honesty if this were my situation I'd just make sure the router was in arms-reach of my desk, and the cables well labeled. Then I'd physically unplug the connection for any computers who's users I felt needed to spend more time in the "real world". How can I tell what internet activity is happening on my machine? Network activity can happen for many reasons from expected to benign to malicious. There are free tools that allow you to easily see what's happening. I must say I am highly impressed. I happened on this site while looking for a monitoring tool, and this provided exactly what I was looking for. Informative and highly useful! My thanks! to monitor softwares such as Kazaa? Instead of physically unplugging the router connection belonging to the person who you think needs to spend more time "in the real world", you might be able (depending on your router) to allow connections during a particular time period only. Searching a whole day for this tool on internet! And now it seems already been installed, perfect!! I'm a student and i share the internet connection with 40 other students..
One of them started downloading big files and we all where thrown on smalband. I don't know who but this tool might be usefull to identified the student. IS there any solution for this, without synchronizing everybody's computer on the same network...? Hi, this looks very helpful but ever time i try and add a computer for example \\max it say: Unable to connect to machine. anyidea on how to over come this? source code available. It allows you to see who uses the bandwith in the local network. I visited a web page that showed percent of bandwith used at the top. I would like to add something like that to my site, but have been looking for hours and now am posting here. Do I need to have a router that logs that info ? I don't. 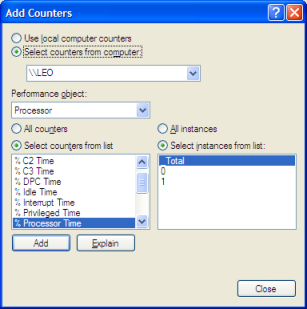 Of special note is the Select Counters from Computer option in the Add Counters dialog above. Perfmon allows you to monitor the performance of another Windows XP, 2000 or NT computer remotely, across your LAN. This means, for example, if someone on your network is hogging all the bandwidth then you can monitor each machine remotely in real time to see just who that might be HOW DO THIS WORK? Thanks, very descriptive and helpful information that you posted. I have found the perfect tool for controlling my kids time on the computer. It's called "Enuff". 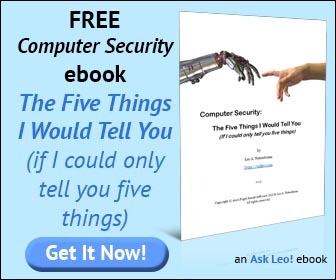 You can control exactly how much time on the computer and when and who, and even what, and it can all be controlled from your machine over a network. You pay for it once, but it really works well and is simple to use. I was having a problem with my son "hogging" all of our bandwidth with World of Warcraft, and his Xbox 360 live account, so I used QoS to limit the amount of bandwidth his computer and Xbox can use when there is a large load on my router. DD-WRT is easy to setup on a Linksys WRT54G, or a Netgear WGR614L. I am using XP with SP3,on running perfmon...under PERFORMANCE OBJECT no drop down is available....why so? You need a bandwidth monitoring software. I recommend "WFilter", which can monitor email/web/bandwidth/ftp/messenger. Hello, I was also having the issue that only the computer I was using perfmon on was available for monitoring despite multiple computers connected to the router. I was hoping for some advice on how to get the others to appear. Please, and thank you. You would be pleased to use this software : CCProxy. You said: "In all honesty if this were my situation I'd just make sure the router was in arms-reach of my desk, and the cables well labeled. Then I'd physically unplug the connection for any computers who's users I felt needed to spend more time in the "real world"." What if the other computers use a wireless connection? @SomeGuy- There are some options to view wireless bandwidth. Check into options for your router if you are tech savy enough to install the software. You typically need a Linksys WRT-54G (or variant of) router for the most compatibility for the software thats out there and free. Look up Tomato Firmware or DD-WRT for more information. Both of those software companies will inform you which router they are compatible with. 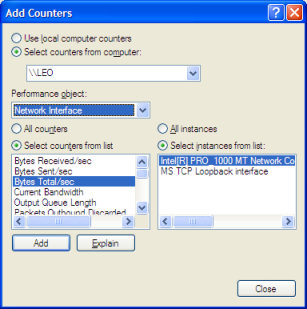 The Tomato software has the capability to set specific computers to levels of priority, including bandwidth allocation. Hope this helps. Hi. i have a Zyxel wireless access point. I have about 5 computers sharing one internet connection. Is there a way I can monitor the bandwidth usage of all 5 computers without buying a server or installing a 3rd apart software apart from what the AP offers? How to check data speed bw two IP's in diffrent gatways in wan. 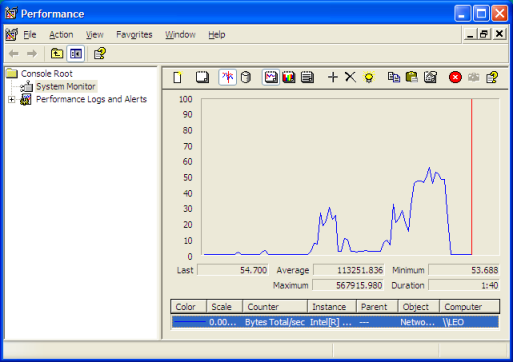 "Perfmon allows you to monitor the performance of another Windows XP, 2000 or NT computer remotely, across your LAN. This means, for example, if someone on your network is hogging all the bandwidth then you can monitor each machine remotely in real time to see just who that might be." It is configurable and shows usage (and other stats) in a clear format (actually several clear formats). I can track my daily usage and it will alert me when I get to 80% of whatever monthly cap I specify. Did I mention it's free? A cheap and great way monitor and control bandwidth usage of computers connected to your SOHO is with the use of a linksys wrt router running dd-wrt firmware. You can set the speed on each port on the device. The upload and download graphs are realtime and easy to read for those who want to monitor. Remember also that QoS can be used on most home routers to prioritize applications that needs bandwidth. Hope these tips help. Hello! Thanks for the tip! I have a laptop just like nearly everyone in my school. My are complete freaks, to be honest, i hate them. They allowed me to have a internet connection for a week, then they disabled it entirely. Four months later, i still spend all my time on the laptop. I have installed tons of movies, music, games, animes. If i need something, I can use my USB and get what i want. My point is that you shouldn't underestimate us. My parents blocked me from the router so i get bored of my laptop and go on it less, i now go on it more than ever knowing it really, really pisses them off.